Showers and storms are rapidly organizing south of Mexico. Winds of 40 knots + are already over the Gulf of Tehuantepec. This is not that unusual of an occurance to have winds that strong in the Gulf and is only partially related to the low itself. Quickscat shows a complete surface circulation and this system should become tropical storm Rick soon. As of 10:00 am edt / 7:00 am pdt the "tropical disturbance" was centered near 12.0° N / 95.5° W or about 265 miles south Puerto Angel, Mexico. Top sustained winds are estimated at 35 mph. The "tropical disturbance" is moving northwest about 10-15 mph. Early forecasts keep "Rick" offshore west of mexico over the next several days. It is possible that there will be a turn toward the Baja beyond 5 days. We think that NHC is way behind schedule for naming tropical storm Rick. The cloud pattern shows an impressive swirl with a solid cdo. Well organized banding is now shaping up too. Not only is this a tropical storm now, it is well on its way to becoming a hurricane and may be so by tomorrow if this trend continues. With this system so far south, significant strengthening is likely to occur. NHC's assessment of a major hurricane is reasonable to us. Only some rain bands are affecting the coast. The worst of the weather remains offshore. 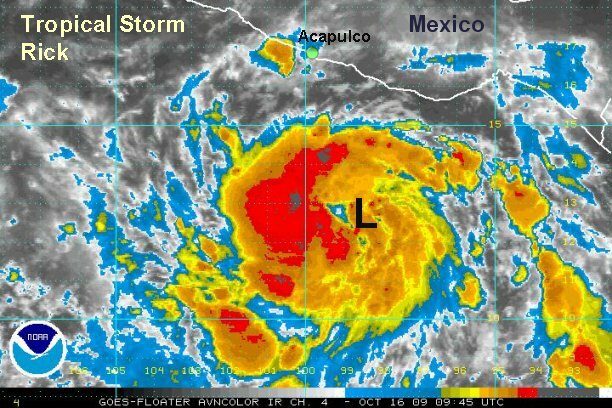 As of 5:00 pm edt / 2:00 pm pdt tropical depression 20-E was centered near 12.1° N / 97.0° W or about 385 miles south southeast of Acapulco, Mexico. Top sustained winds are estimated at 55 mph (NHC 35 mph). 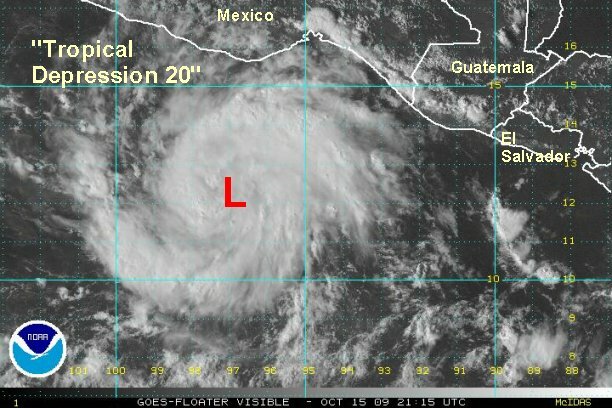 Tropical depression 20 is moving northwest about 13 mph. The National Hurricane Center will upgrade to tropical storm Rick in little over a half an hour at the 11 pm edt / 8 pm pdt advisory time. After being very far off, NHC has finally pumped Rick up and now our estimates of the structure and strength are agreeing. Rick had ungone a period of very quick organization yesterday which has now slowed. We do believe that Rick could become a hurricane by later today, especially if the strengthening phase picks up again. Only a few rainbands are touching the coast. 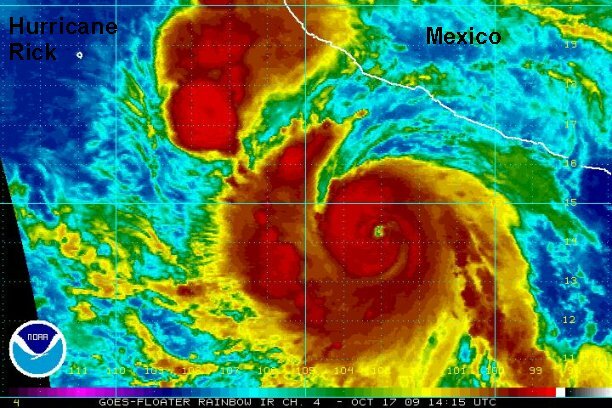 The worst of Rick should stay west of the west central Mexican coast. Rough surf as well as a few rainbands appear to be the biggest concern at this time. As of 7:00 am edt / 4:00 am pdt tropical storm Rick was centered near 12.6° N / 98.9° W or about 295 miles south southeast of Acapulco, Mexico. Top sustained winds are estimated at 65 mph (NHC 65 mph). Tropical storm Rick is moving west northwest about 9 mph. Forecasts continue to keep Rick offshore west of mexico over the next several days. It is possible that there will be a turn toward the Baja beyond 5 days as a hurricane. 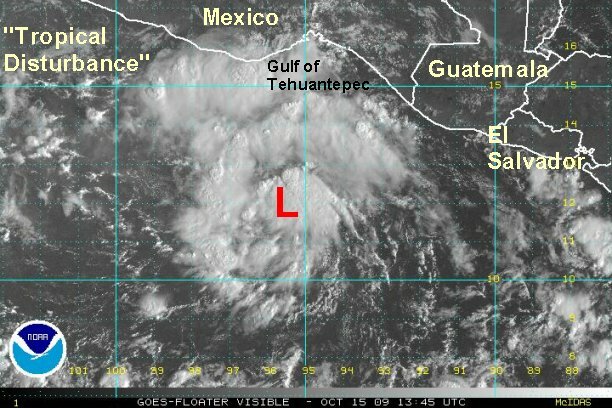 Interests in the southern Baja should follow the progress of Rick. Rick was officially upgraded to a minimal hurricane on the 8 am pdt / 11 am edt advisory. This seems resonable to us as the latest visible satellite image shows an eye forming. The next complete update will be later today. Rick has picked up its rapid strengthening phase today and will likely be a category two hurricane soon. Spiral banding is now well developed. the motion looks to be more northwest instead of west northwest in which it was moving earlier today. This will need to be watched closely. 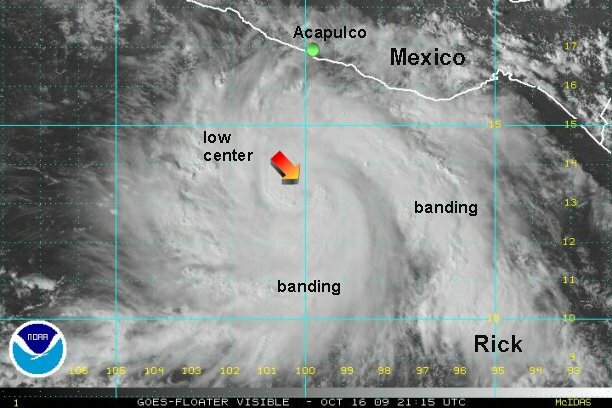 As of 6:00 pm edt / 3:00 pm pdt Rick was centered near 13.0° N / 100.0° W or about 270 miles south of Acapulco, Mexico. Top sustained winds are estimated at 90 mph (NHC 85 mph). Hurricane Rick is moving northwest about 9 mph. I.R. satellite imagery shows that Rick continued its rapid deepening phase overnight. Nhc has now classified this as a minimal category 4 hurricane in which we agree. The intensity was based on a satellite estimate. 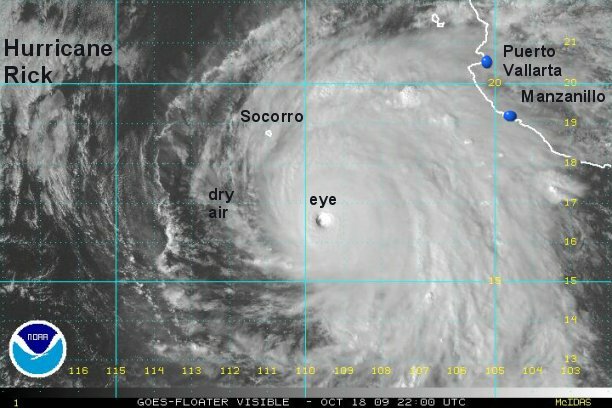 The highest winds are on the southwest side of the hurricane in the eyewall. The strongest spirial band is also farther out to sea on the westside too. One rain band with torrential rain is on the west central coast between Cabo Corrientes and Manzanillo. 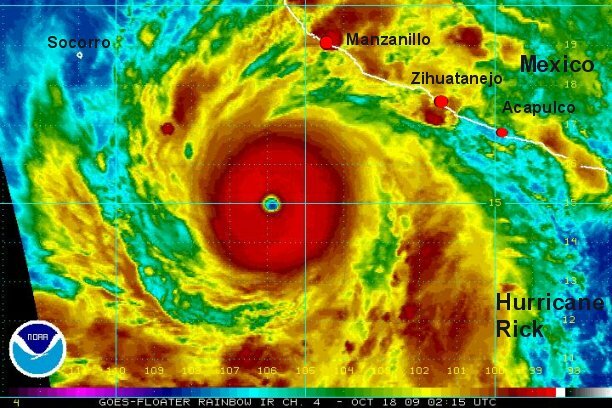 As of 8:00 am edt / 5:00 am pdt Rick was centered near 14.2° N / 102.5° W or about 265 miles southwest of Acapulco / 365 miles south southeast of Manzanillo, Mexico. Top sustained winds are estimated at 135 mph (NHC 135 mph). Hurricane Rick is moving west northwest about 12 mph. Forecasts continue to keep Rick offshore west of mexico over the next several days. Some forecasts take Rick into southern Baja around the Wednesday / Thursday time period as a hurricane. Interests in the southern Baja should follow the progress of Rick closely. The first visible satellite images are in showing the impressive structure of Hurricane Rick. It appears to us that the strength has not changed much. 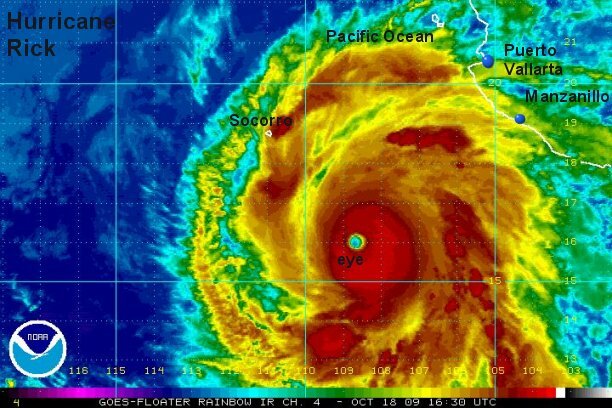 The Hurricane Center has upped their winds to 145 mph despite infrared satellite showing cloud top warming indicating a possible temporary weakening. They are basing this windspeed on a satellite estimate of 127 knots (146 mph) at about 9 am edt / 6 am pdt. The cloud top warming has occured since then, so we will stick with our 135 mph wind now. This may be a little high. Seas are estimated at 12 feet on the coast and up to 40 feet under the eyewall of Rick. 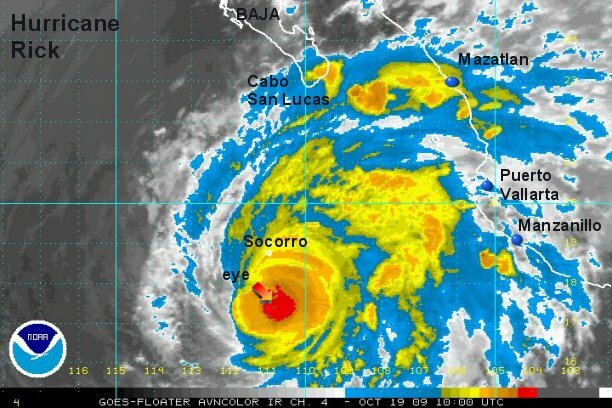 As of 11:00 am edt / 8:00 am pdt Rick was centered near 14.2° N / 103.0° W or about 280 miles southwest of Acapulco / 345 miles south southeast of Manzanillo, Mexico. Top sustained winds are estimated at 135 mph (NHC 145 mph). Hurricane Rick is moving west northwest about 12 mph. The strengthening phase started again earlier this afternoon. Cloud tops have rapidly cooled in the eyewall over the past few hours. 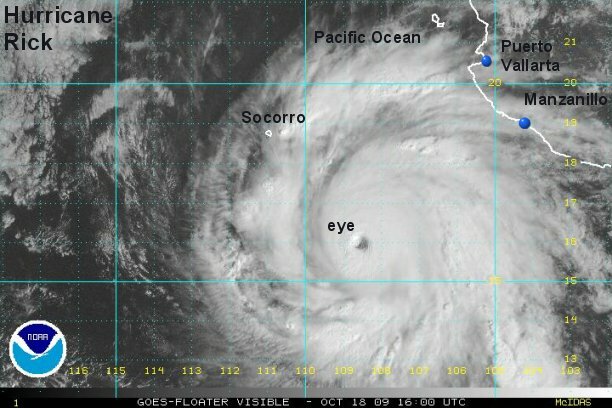 The eyewall has also become thicker. This all adds up to a stronger hurricane. A satellite estimate of a few hours ago estimated 150 mph. Since then additional strengthening has occured. We believe that the hurricane center will up their winds to be very similar to our on their next advisory. Rick has picked up a little forward speed this afternoon. Seas are estimated at 12 feet on the coast and up to 40 feet under the eyewall of Rick. Despite the danger offshore, the western coast of Mexico is enjoying a very nice day today. 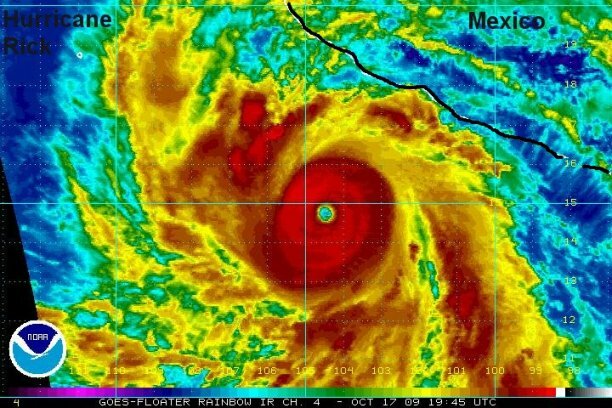 As of 4:00 pm edt / 1:00 pm pdt Rick was centered near 14.9° N / 104.6° W or about 335 miles west southwest of Acapulco / 290 miles south of Manzanillo, Mexico. Top sustained winds are estimated at 155 mph. Hurricane Rick is moving west northwest about 17 mph. NHC will update to 150 mph on the 5 pm edt / 2 pm pdt advisory. They took the satellite estimate from a few hours ago. 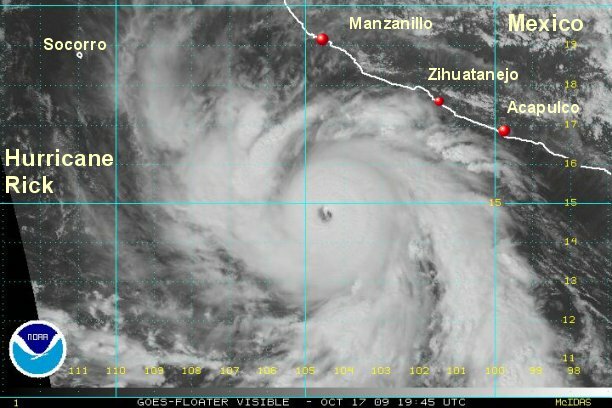 As the National Hurricane Center points out, Hurricane Rick is now only behind Hurricane Linda of 1997 as the strongest hurricane on record in the eastern Pacific. The colorized satellite imagery shows a rare, near perfect CDO or central dense overcast. Rapidly deepening has continued today as the eyewall has increased in size with near perfect symmetry. Surf of 12 feet + can be expected on the west central coast of Mexico south of Cabo Corrientes. Under the eyewall, seas up to 50 feet with some higher waves can be expected. Thankfully weather on the coast is realitively nice with partly cloudy skies and scattered showers and storms. 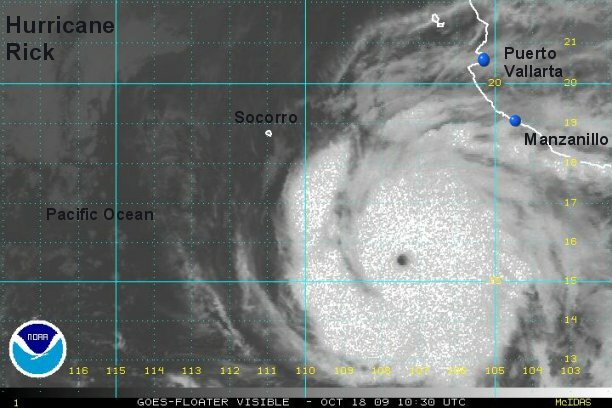 As of 11:00 pm edt / 8:00 pm pdt Rick was centered near 15.0° N / 105.9° W or about 295 miles south southwest of Manzanillo / 605 south southeast of Cabo San Lucas, Mexico. Top sustained winds are estimated at 180 mph (NHC 180 MPH). Hurricane Rick is moving west northwest about 14 mph. Hurricane Rick remains a very dangerous hurricane, although the perfect symmetry is now gone. Over the past few hours an outer band has flared up just west of the "CDO" or central dense overcast. 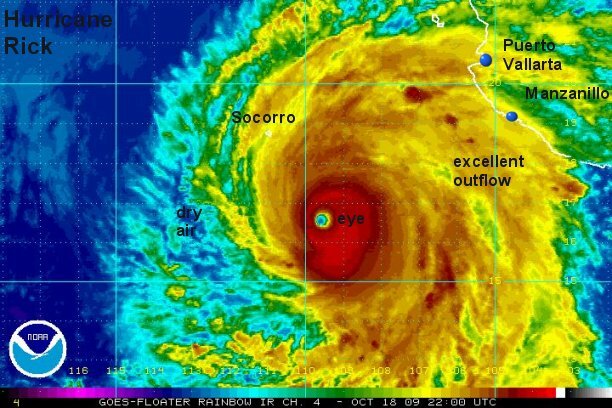 That's the big circular cloud mass around the eye of the hurricane. The strongest part of the eyewall is now on the east side of the circulation. Rick still remains just far enough offshore so that the weather isn't too bad. Some heavy rain squall are near the coast south of Manzanillo this morning. Last night Manzanillo had a rain squall with only winds up to 15 mph. Some of the gusts with the next squall may be in the 25-35 mph range. Surf of 12 feet + can be expected on the west central coast of Mexico south of Cabo Corrientes. Under the eyewall, seas up to 50 feet with some higher waves can be expected. 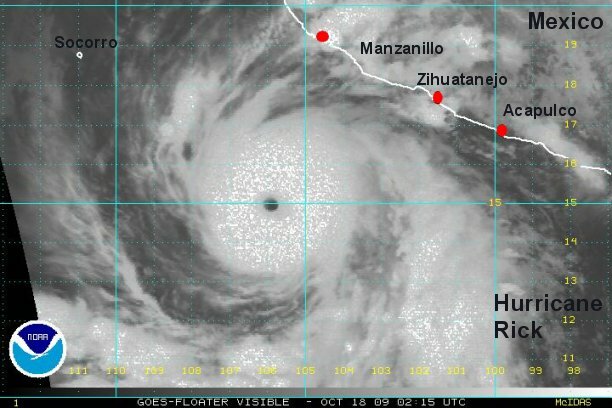 As of 8:00 am edt / 5:00 am pdt Rick was centered near 15.8° N / 107.7° W or about 510 miles south southeast of Cabo San Lucas, Mexico. Top sustained winds are estimated at 180 mph (NHC 180 MPH). Hurricane Rick is moving west northwest about 14 mph. The most recent satellite images show cloud top warming and an asymmetrically shaped CDO. Outflow aloft is being restricted on the west side of the circulation a bit. It still remains excellent on the east side and good to very good west side. Rain bands are occasionally grazing the coast, but overall not making a significant impact. 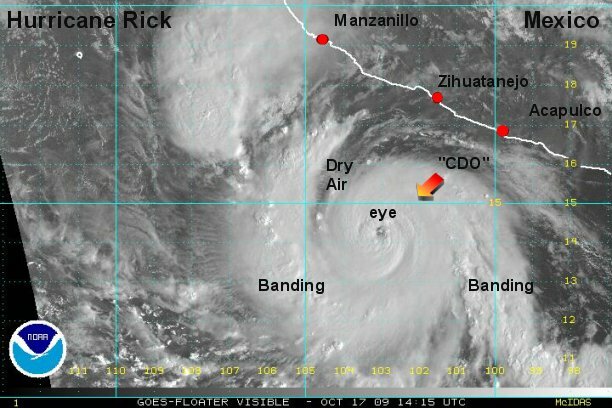 As of 1:00 pm edt / 10:00 am pdt Rick was centered near 16.0° N / 108.8° W or about 480 miles south southeast of Cabo San Lucas, Mexico. Top sustained winds are estimated at 165 mph (NHC 175 mph). Hurricane Rick is moving west northwest about 14 mph. The overall synopsis of the situation from earlier today has not changed appreciably. The main factor that we are watching is dry air to the west of hurricane Rick which has eroded the thick eyewall on that side of the hurricane. Because of this we are taking down the winds to 150 mph - a strong category 4 hurricane. Rick is expected to continue to move in the same general direction then slow Monday night before turning northeast early Tuesday. This turn is from a very strong upper disturbance diving into the southwestern U.S.. This new motion will put it in the vicinity of Cabo San Lucas by early Wednesday. 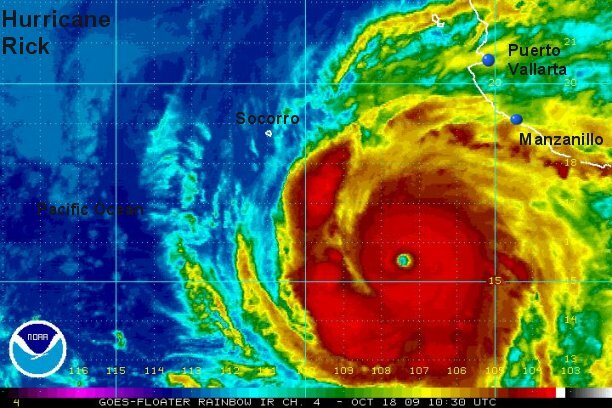 As of 8:00 pm edt / 5:00 pm pdt Rick was centered near 16.8° N / 109.9° W or about 425 miles south of Cabo San Lucas, Mexico. Top sustained winds are estimated at 150 mph (NHC 160 mph earlier advisory). Hurricane Rick is moving west northwest about 14 mph. Just as quickly as Rick strengthened, it has now weakened. The overall satellite depiction looks rather poor. We are estimating our strength considerably lower than NHC. A Hurricane Hunter will investingate to find the exact wind speed later today. 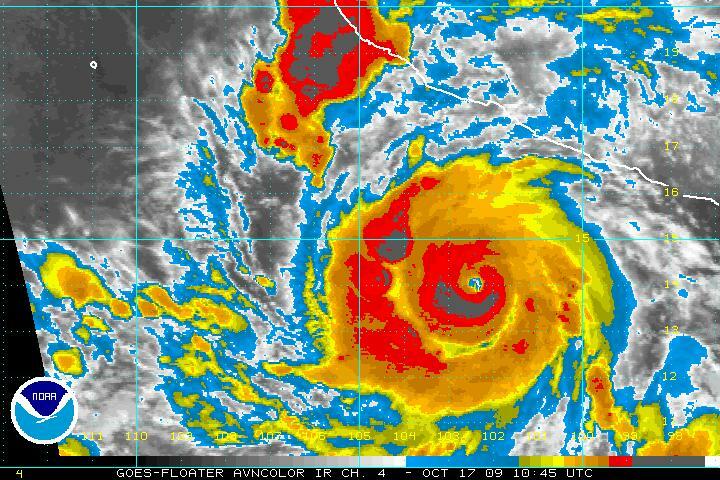 This news bodes well for Los Cabos as it decreases the chances of them being impacted by a hurricane. Dry air and restricted outflow aloft to the west of Rick should keep it on a weakening trend. Rick has already starting slowing down its forward speed. It will be making a turn to the northeast very late toady or early Tuesday. This turn is from a very strong upper disturbance diving into the southwestern U.S.. This new motion will put it in the vicinity of Cabo San Lucas by early Wednesday. Surf of 9 feet + can be expected on the west central coast of Mexico near Cabo Corrientes and 6 feet and increasing near Cabo San Lucas. Under the eyewall, seas up to 45 feet with some higher waves can be expected. Seas will gradually diminish near the hurricane center today as the hurricane has weakened. As of 8:00 am edt / 5:00 am pdt Rick was centered near 17.5° N / 111.0° W or about 375 miles south of Cabo San Lucas, Mexico. Top sustained winds are estimated at 105 mph (NHC 125 mph earlier advisory). Hurricane Rick is slowing down, moving northwest about 7 mph.